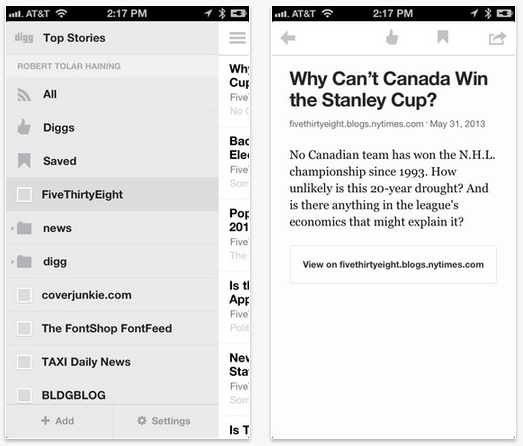 Digg Reader, Digg’s alternative for the RSS aggregation addicts who will be bereft when Google Reader finally shuts down on July 1, is now available on the Digg iOS app. An Android app is expected to make its debut in the next three to four weeks. Digg Reader is bundled into the Digg iOS app instead of being offered as a standalone app because the company sees Digg.com and Digg Reader as complementary products. In Reader, users can “digg” the feed they are reading, which helps the site track trending content. This in turn helps Digg refine its Popular Sort, which scores the last thousand items to determine the most popular content at that given time. Eventually, Popular Sort will also be able to determine the top trending content in your social circles, over a given period of time or in a particular location, which in turn will help power Digg.com. Digg will be able to use the data sourced from Digg Reader to build a consumption experience that will offer the customization of a reader, but without the work of subscribing to different feeds. 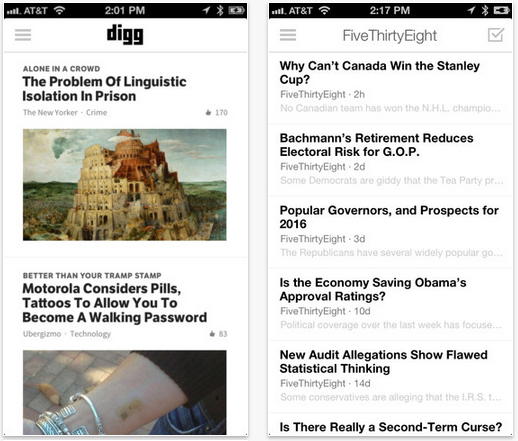 Opened in beta two days ago, Digg Reader was designed to offer the same speed and reliability that users expected from Google Reader. Though many users see it as a Google Reader replacement, Digg Reader is more than just that–it’s an instrumental part of Digg’s strategy to regain the influence it once had. As Sarah Perez recently wrote, Betaworks, which acquired the site last year, has been working on giving Digg a complete makeover, keeping just the brand, domain name and the well-known “thumbs up” symbol. Their strategy has worked so far, with BuzzFeed reporting in April that referral traffic from Digg to online publishers has grown by 93 percent over the past 12 months. Digg GM Jake Levine has said that Digg Reader is designed for the “hyper power users who want to do a lot of work to customize their reading experience.” These RSS feed addicts are often the people who are first to spot stories that will eventually go viral on networks like Digg, Reddit or Twitter, so it’s understandable why Digg is putting so much effort into keeping them engaged. Digg Reader is among several RSS aggregators that have stepped up to fill the void left by Google Reader, including Feedly, Reeder and Flipboard. For a breakdown of Digg Reader’s functions and how it compares to Google Reader and other services, see Sarah Perez’s recent review.